For five glorious minutes, I am going to focus on what I have accomplished in my garden so far this spring, and not on what I still need to do. Cleaned up the grape arbor bed, which has been an eyesore for several years. Dug out the nasty Forsythia x intermedia ‘Arnold Dwarf’, which has been a poor performing shrub ever since I planted it. Removed all the ribbon grass, leaving a nice area to plant new perennials. Weeded and prepared the vegetable garden for planting. Kept up with the mowing and trimming of the lawn. And last fall, I straightened up my retaining wall bed, and dug out all the English ivy I foolishly planted there. For the first time in a long time, I feel like my garden is under control, that there is no area that needs major renovation or extensive weeding or that I would be embarrassed for someone to see. So I’ll take five glorious minutes to just enjoy this feeling and smell the lilacs. Ahhh… the smell of lilacs in the spring. Yes, there are weeds sprouting behind my back and more flowers that will soon need to be deadheaded. And I still have much to do in the garden this spring, mostly planting, and ideas for more garden beds to be dug. But that doesn’t matter right now, I’ll think about that tomorrow. These five minutes are about just being in the garden, enjoying it and resting in it. You deserve to have these 5 mintues of rest and relaxation. Actually I think you deserve more if you choose to take them. I hope this isn't a repeat of my previous comment. I couldn't tell if it was accepted or not. Just relax and don't worry. I was going to say something along those lines: only 5 minutes? Why not a whole half an hour? Be generous with yourself! Good for you focusing on the positive! You've accomplished a lot considering the poor weather we've had recently. I'm sure you would have a lot more on your list if the weather had been better during your time off. Carol, this is an interesting topic. We think and concentrate about what we have to do, but ones it's done, we forget about it. Carol my dear you should take much longer than 5 minutes to enjoy the fruits of your labor as you have worked so hard. Be a daredevil and take an hour or two or three. ;-) Gorgeous lilacs, wish I could smell them. I don't have any yet but I will because who would want to do without them? You have cut some lilacs for the vase, haven't you, so you can enjoy he wonderful scent indoors too? BTW wishing you lots of new blooms for GBBD! Hi Carol, good idea to take a breather before bloom day, if it is anything like last month, you are going to be very busy at the computer tomorrow! Focusing on what is instead of what could be is a good thing! We can get so overwhelmed looking at and thinking about what has to be done! Gardens are so satisfying when all the chores are completed..we are slowly completing all our garden chores after getting back home from a winter away.Now I'll go back and view all that you've done! 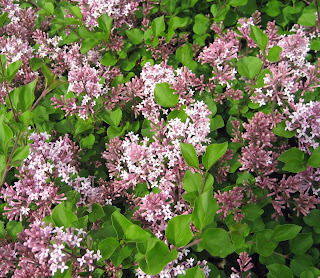 Lie down in your beautiful lawn and enjoy the fragrance from your Lilacs. I did enjoy the links, lots of fun to read older posts and get to know you and your garden better. I'm also going to try to focus on what I have gotten done so far this year. Thanks for this post- I needed it! You've accomplished a great deal already, and I'm sure your gardens look the better for it. :) Kudos! Or maybe even go for 10! ;-) It can be hard to just sit and enjoy a feeling of accomplishment in the garden. But luckily for us, the work feels like fun too, right? Enjoy! Hooray for the five minutes! I hope you get to do that every day times 4! Sometimes 5 minutes is all you need. Now, don't we all feel better?